Marc shares some of the events that happened on this day in history, including the deaths of Mahalia Jackson and Pete Seeger, the liberation of Auschwitz, and the 1969 Eldon Avenue Axle Plant wildcat strike. That was Mahalia Jackson singing “We Shall Overcome”. Today in 1972, Mahalia Jackson passed away. She was born in New Orleans. When she moved to Chicago in 1927, she met Thomas Dorsey, The Father of Gospel Music, and she toured with him for 14 years. In 1948, she recorded Move On Up A Little Higher, which went on to sell 8 million copies. Mahalia Jackson became a crossover wonder; she is in every Hall of Fame you can name. At the storied 1963 March On Washington when Dr. Martin Luther King Jr. was speaking, she famously kept saying “tell them about the Dream, Martin, tell them about the Dream” –. and he did. 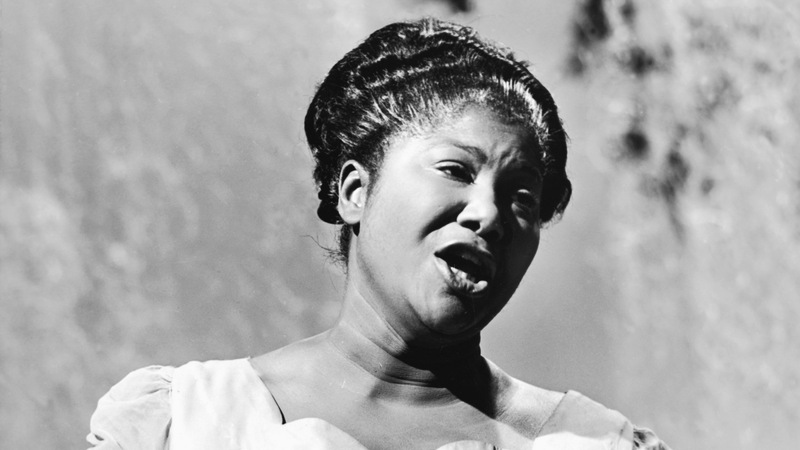 We remember the great Mahalia Jackson. And today in 1945, the Russians liberated Auschwitz. And today, Leontyne Price made her debut at the Metropolitan Opera in Il Trovatore in 1961. This was groundbreaking for her peers and the binds of the unspoken racial segregation that made it all but impossible for Black operatic talent to join the big leagues. And in 1969, there was a wildcat strike in Detroit at the Eldon Avenue Axle Plant. Now, that in itself would not particularly stand out in history had it been organized by the Revolutionary Union Movement, known as RUM. Each auto plant had one, and this was the Eldon Avenue Revolutionary Union Movement. Today, the Black workers walked out with the Polish women workers. This movement went on to become the Union of Revolutionary Black Workers that won major concessions from the auto industry and became a serious political force in Detroit. And we remember Charles Lutidge Dodson, who passed away today in 1847. Most of us never heard that name, but that’s because the brilliant author of Alice’s Adventures in Wonderland wrote under the pen name of Lewis Carroll. Here’s a great song and for us to think about on this January the 27th. “Where Have All The Flowers Gone”, “If I Had A Hammer”, “Turn Turn Turn”, and yes, “We Shall Overcome”, which we heard at the top of today’s Day In History. Those are songs for all time, written by and first sung by and given to the world by one of the greatest songwriters, performer, revolutionaries, fighters for social justice, who sang at Obama’s first Inauguration. He performed until just shortly before he passed away at the age of 99 – the legendary, gentle, human being Pete Seeger passed away last year on this day. And we’re hearing “Turn Turn Turn”.